When M152 was fitted with his refurbished radio collar, he also received a health check. During the health check he wore a special hood. 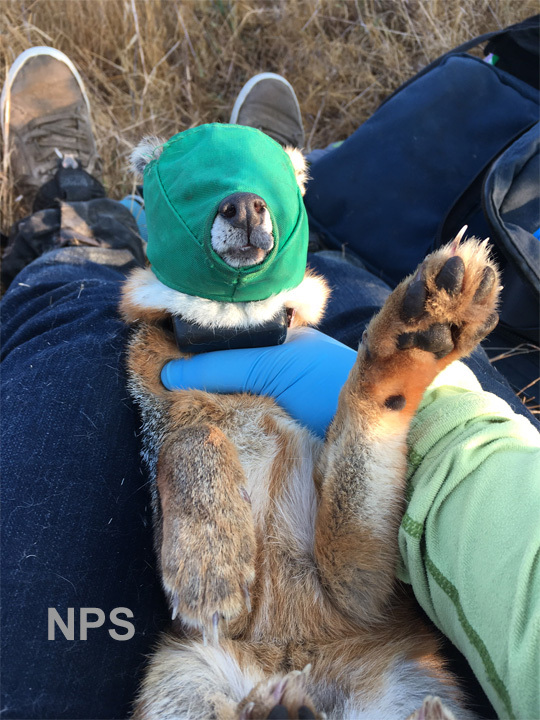 Having his eyes covered makes the health check less stressful and helps the island fox remain calm. Weighed - to compare his weight with previous years and to provide an overall view of the population across the island. How much did M152 weigh? 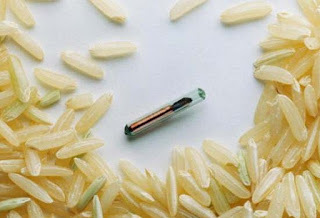 Blood Sample - A sample of his blood was taken to look for evidence of exposure to disease. In 2016-2017 blood samples documented adenovirus, commonly called "kennel cough," as it moved across Catalina Island infecting 85% of the island fox population. 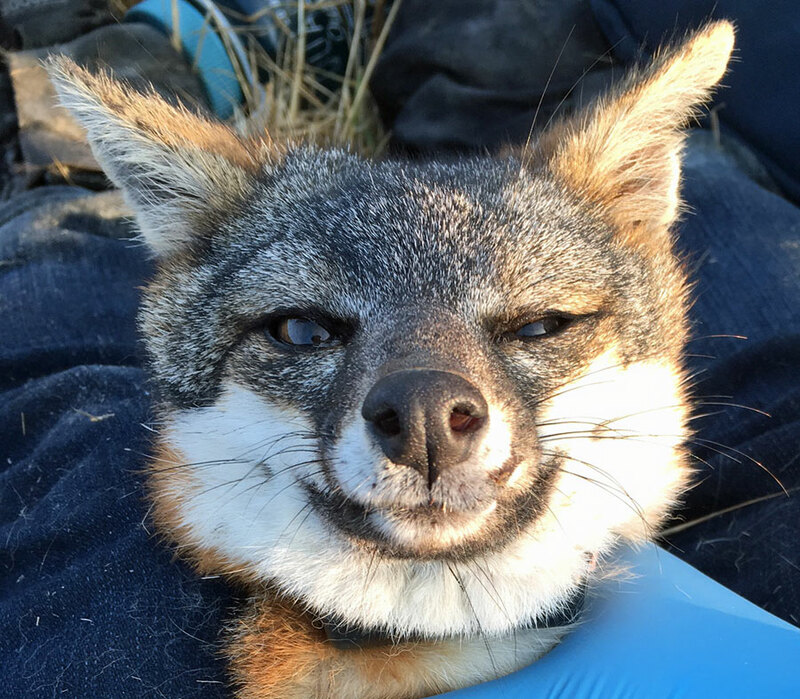 (See 2018 Update) Fortunately, no island fox deaths were attributed to the virus, but it demonstrated how fast an infectious disease can spread through island foxes. Testing blood samples provides an early warning of dangerous diseases like canine distemper, parvo, and more. It can also indicate whether disease might be influencing low pup survival. Some of M152's blood was also set aside to test for specific white blood cells. A high number of these cells may be evidence of a parasite infection. 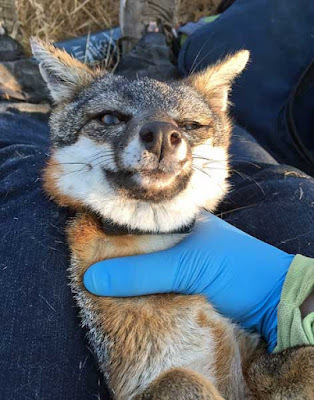 Some of the blood sample will also be used for DNA studies to determine the familial relationships between individual foxes. How are the pups in M152's territory related to him? All of this is above and beyond simple monitoring. Your donations help make this health research possible. Disease - M152 showed no signs of disease. He appeared healthy. 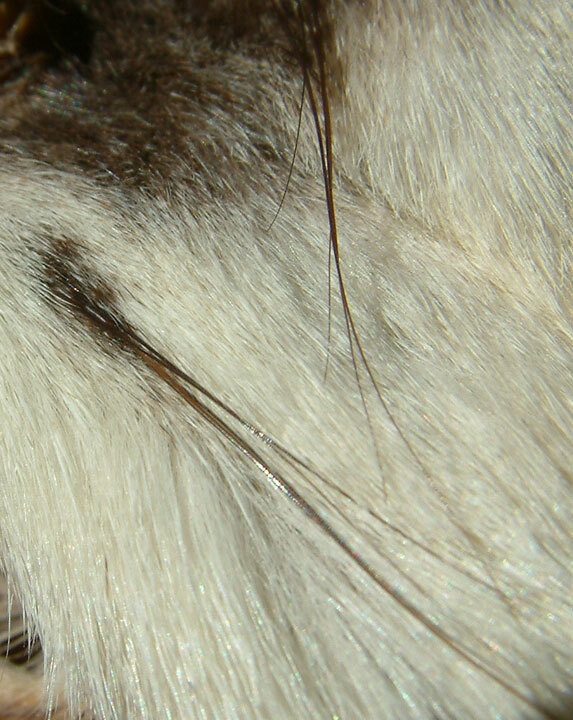 Whisker Sample - A whisker sample was taken for an important research study on diet funded by Friends of the Island Fox. Tick Testing - M152 was examined for fleas and ticks. Luckily he was tick free! But not all island foxes are so lucky. Tick-borne disease is a new threat to island foxes. 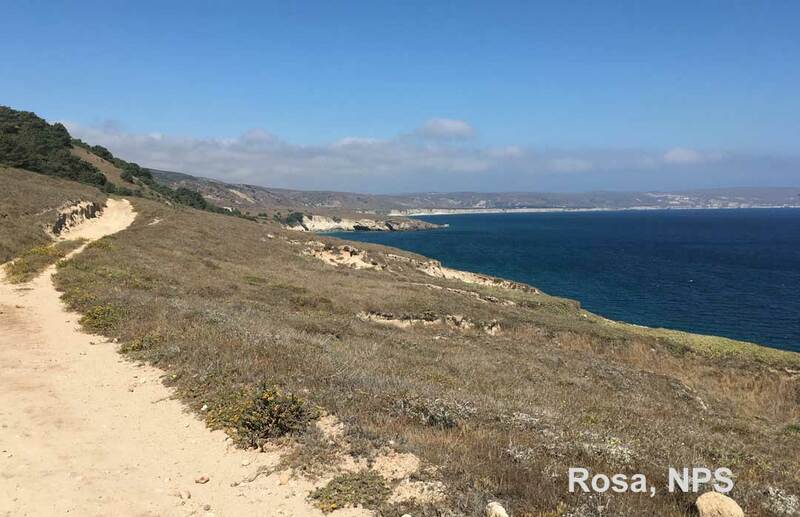 Two infectious diseases carried by ticks have recently been discovered on the Channel Islands: Lyme disease and relapsing fever. 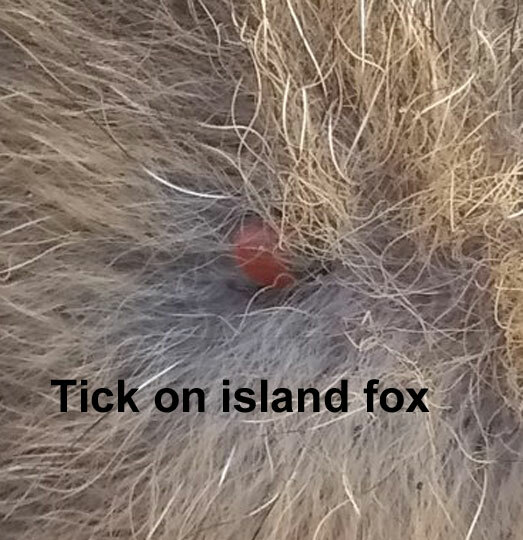 Ticks found on island foxes, like the one on the back of an island fox's ear, pictured at right, are being removed and tested for disease. 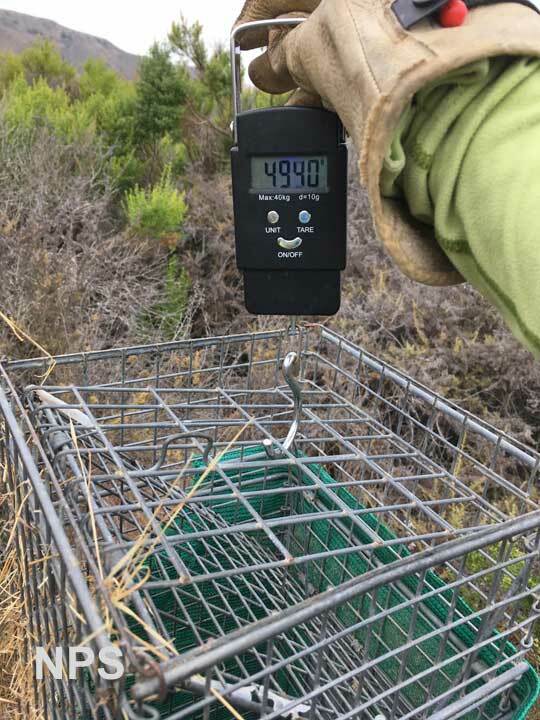 This is important research for island foxes and people. How many ticks are carrying disease? How many island foxes are infected? Lyme disease seriously impacts dogs; is it impacting island foxes? 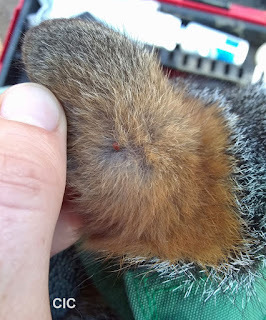 The tick is removed and tested to see if it is a disease carrier. 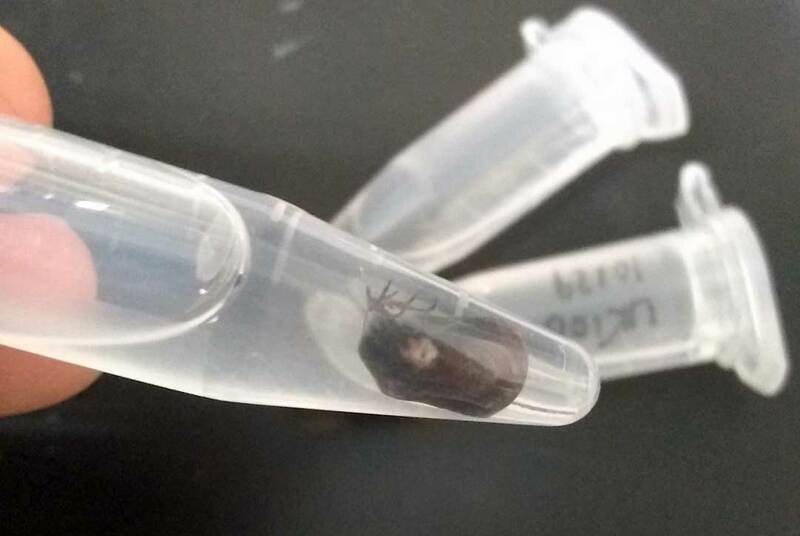 Tick after removal and prepared for testing. Tick-borne disease is a new threat. We need your help to fund testing of ticks. Removing the tick is also beneficial to the island fox. 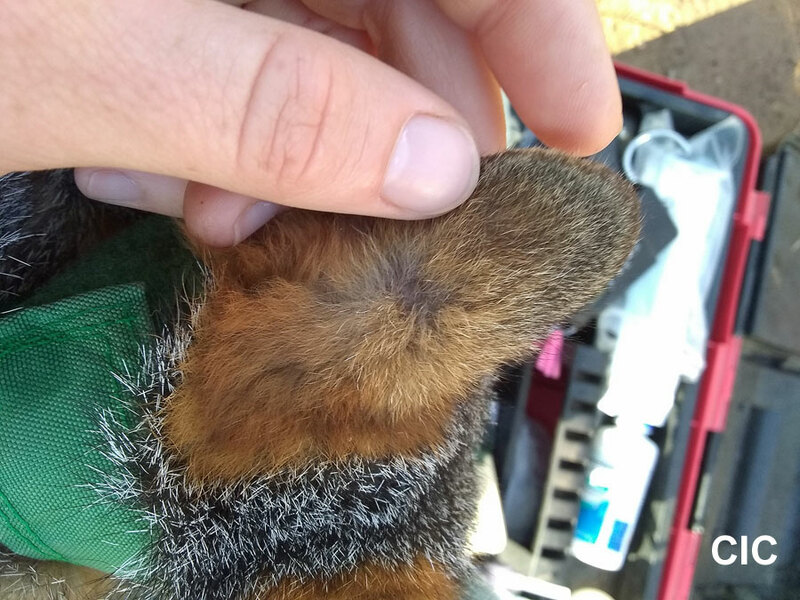 Island fox ear after tick is removed. Island foxes need your help. proactive health testing, and vital research. With your continued support, we can hold onto success and keep island foxes like M152 healthy into the future. 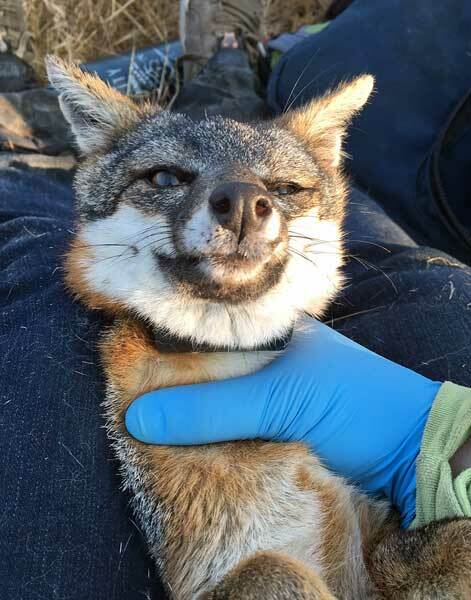 This male island fox just got a radio collar funded by donations to Friends of the Island Fox. It's that bit of black just under his chin and above the biologist's gloved hand. This radio collar will allow biologists to monitor M152 without interfering with his normal wild life. He can be checked-on from a distance by a technician with an antennae and receiver or even from a small plane flying over the island. M152's radio-tracking collar emits a unique radio-signal frequency just for him. His collar locates his position and reports that he is moving around normally. If M152 should stop moving for 4-6 hours–not move at all–the radio collar will give off a different signal. Hear - Distress alert from radio collar The rapid beep alerts biologists that something might have happened to him. 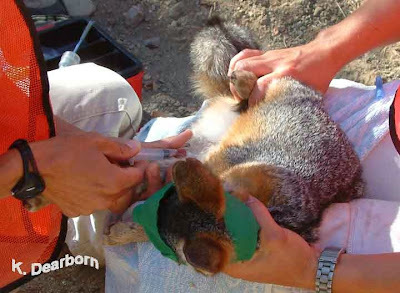 The radio collar then enables biologists to hone in on the little fox body so they can find out what has happened. M152's newly refurbished radio collar will provide information on his activity for the next 2-3 years. 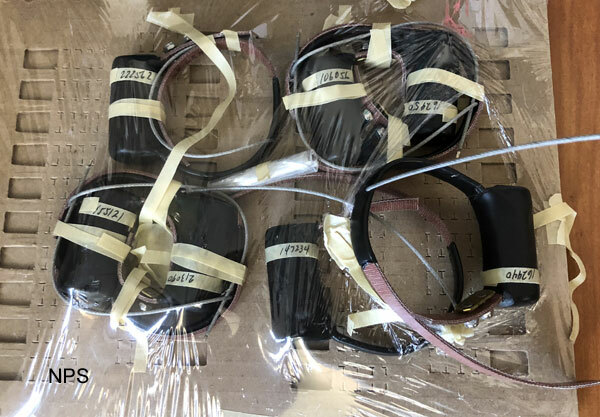 On each island approximately 20 radio collars need to be refurbished or purchased new each year. 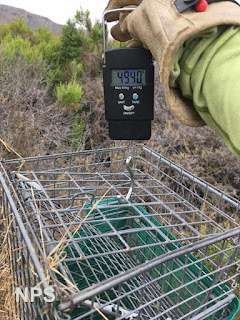 Won't you help with this vital effort to monitor island foxes! You've helped us save island foxes from extinction. 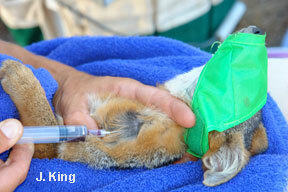 Please donate to help keep island foxes safe and healthy. Stay tuned. M152 also got a health check. Find out what we learned about him.